"ive never really liked hulk comics, and this comic sticks with that statement"
One of the reasons that I like reading Hulk comics is that they are usually pretty fast reads. Hulk gets mad, Hulk smashes, fun is had by all, the end. This, however, was very wordy and was full of terrible attempts at humor ( Hulk actually stops in the middle of a battle to say "Hulk hates personal pronouns". Yeah...). Finally-and I don't know if reading other House of M stories would have made this any better-but it was just full of people I didn't care about doing things that I didn't care about (and didn't seem to amount to anything by the end).If you just have to read anything with the Hulk in it or you want to read all of the House of M stories then give this one a shot. Otherwise I recommend you steer clear of this volume. In the House of M reality, Bruce Banner had joined the tribe of the Aborigines in Northern Australia, where he can live in peace and just "be left alone". Trouble starts when government troops show up and start hassling human refugees & the Aborigines. Hulk takes care o'biz and eventually makes his way to Sydney, disposes of the mutant governor in charge of the continent, and takes charge of running the country and making it a safe haven for humans from mutant oppression.I like the way Peter David writes, the situations he puts the characters in and how they eventually resolve issues/problems. And let's not forget the dialogue & the play on words, at which he excels. All the things that I love about his writing techniques from his current X-Factor run (starting with X-Factor Vol. 0: Madrox - Multiple Choice and currently at X-Factor - Volume 19: Short Stories) are here. It should be noted that this Hulk book was written just before the X-Factor re-launch (the first arc dealing with the "No More Mutants!" fallout).Overall, this is one of the better "House of M" tie-ins, even though it takes place far away from the main storyline (geographically, that is!) and there is no involvement whatsoever from the other Marvel heroes. This book Is part of the House of M crossover event and collects Incredible Hulk 83 - 87. 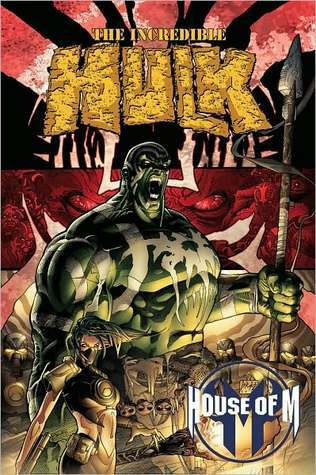 It was written by Peter David who has got to be the writer most closely associated with the Hulk after Stan Lee. The main story (the first four chapters) was illustrated by Jorge Lucas who is an Argentinean artist whose work I have not come across before but who has had short runs on a variety of Marvel books.The story was just OK - given David's reputation I would say that this was probably not one of his best. It didn't have the depth of the Banner book that I read recently or the over the top abandon of World War Hulk. I wanted more of the relationship between Banner, the Hulk and the beliefs of the Australian Aborigines which was touched on in this story but subsumed by the standard superhuman fare. The tension between Banner and the Hulk was quite well explored in the expectations of the human administration who wanted the occasional appearance of the Hulk to appease the populace and Banner who wanted to keep him under check. The art by Lucas was fine without being spectacular. Sabía que PAD no me iba a decepcionar. Bueno, tampoco es que este "elseworld" sea una obra maestra, pero entretiene sobradamente, tira unas cuantas ideas interesantes, entretenidas y bien desarrolladas, y remata con un final entre impredecible y lógico que cierra con bastante coherencia la historia, aunque principio y nudo transcurran en una realidad distinta al desenlace. Eso sí, el dibujo de Lucas de nuevo parece hecho a las apuradas, sin preocuparse por estar a la altura del guion, y promediando para abajo un laburo que con más énfasis visual habría podido quedar buenísimo. Eso sí, el capítulo final, a cargo del Kubert que no me gusta, está un cachito mejor en cuanto a lo visual y es un lindo cambio, justificado por la historia y todo. This is an interesting tie in to House of M, but by no means essential. The narrative is basically a short little story about what the Hulk is up to while the Scarlet Witch is messing with reality. If you read the main mini series or if you are reading it now, than this is a fun little look at the other side of the coin in a mutant dominated world. Otherwise it doesn't appear to have much if any lasting effect on the Hulk. If you haven't read House of M, this will be pretty confusing and it's probably better to skip it. Great tie-inThis TPB contains 3 Hulk issues taking place in the House of M reality, and one issue after the return to our known reality.It is a great tie-in to the Marvel House-of-M event. The art is fantastic, and Peter David has some great lines for the hulk as well ("Can't stand opera", ROFL).If you liked House of M, get this one, too. Hulk and Bruce Banner in Australia during the House of M Mutants rule the world interval. Pretty cool actually. Though I think it too bad they didn't let Bruce hang with the aborigines in the regular continuity. With good enough art - though I can't say I like the way they are drawing the Hulk all that well. I really enjoyed this. I thought it was an interesting take on The Hulk. In the beginning, I was a little confused about what was going on, but it became more apparent to me the farther I got into the comic. I have not read The Hulk in years. The character has gone through a lot of changes, and I enjoyed this version better than the red and grey hulks. A mix of good things, confusing stuff and meh. It was decent, not amazing or anything. Another decent, if forgettable, House of M tie-in. Hulk is fun, enjoys smashing, the end.Also some stereotypical Native American mysticism 'cuz why not? I liked this book. Hulk is Hulk no matter what alternate reality you live in. In my best Ron Perlman imitation, "Hulk... Hulk never changes..."
Amo tu caracter y humor, Hulk. Sos lo más. Me gustó bastante la historia de Hulk con la tribu australiana. Peter David Adam Kubert Jorge Lucas - aka David PetersPeter Allen David (often abbreviated PAD) is an American writer, best known for his work in comic books and Star Trek novels. David often jokingly describes his occupation as "Writer of Stuff". David is noted for his prolific writing, characterized by its mingling of real world issues with humor and references to popular culture. He also uses metafiction frequently, usually to humorous effect, as in his work on the comic book Young Justice.